Mix all marinade ingredients and set aside. Boil noodles  3 minutes  stirring occasionally then rinse well with cold water and drain. Slice thinly crosswise 10 pieces of English cucumber. Shred 1/2 cup carrots [I love using my katsura muki-ki for this]. Grate finely 2 tsp ginger root. 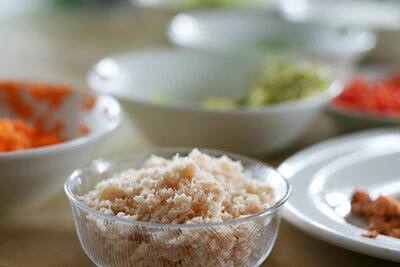 Shred 1/2 cup Japanese radish [Use your katsura muki-ki for this too]. Combine all ingredients and toss well while adding the marinade. Garnish with lemon wedges and wakame seaweed if desired.